A scene from The Last Song Before The War. THE GALWAY African Film Festival, the city's annual celerbration of movies and film-making from across the African continent, returns from Friday May 22 to Sunday 24, with a host of free screenings taking place in NUI Galway's Huston School of Film & Digital Media. This year's programme will have films from Uganda, South Africa, Burkina Faso, Guinea Bissau, Morocco, Mali, and Rwanda. The opening film on May 22 is The Road We Travel, a short by the British based Aidan Belizaire, centring on a friendship that crosses cultural, religious, and ethnic boundaries. It will be followed by the campaigning film, Miners Shot Down (Rehad Desai, South Africa 2014 ) about a miners' strike in South Africa. It has won a number of awards at Human Rights Film Festivals around the world as well as the Jury Award for Best South African Documentary at the Durban International Film Festival, Best Documentary at FESPACO 2015, and the Audience Prize at the Black Movie Film Festival in Geneva 2015. The first day closes with Soleils (Olivier Delahaye and Dani Kouyaté, Burkina Faso/France 2013 ). Funny and thrilling, in parts a love story, in parts philosophical tale, this film embraces the importance of universal wisdom with a touch of magic. Saturday begins with Lantanda (Gorka Gamarra, Guinea Bissou/Basque Country 2014 ) a story of music, the right to use one’s own language, and associated challenges, accompanied by a fantastic soundtrack. Creole is the language used daily by the majority of people in Guinea Bissau, but it does not have the status of official language. In this documentary musicians and writers explain why they use Creole to express their feelings and transmit the social reality of the country. North Africa will be represented by nostalgic Adios Carmen (Mohamed Amin Benamraouri, Morocco, 2013 ) where historic events will be meshed with a Moroccan version of Romeo and Juliet. 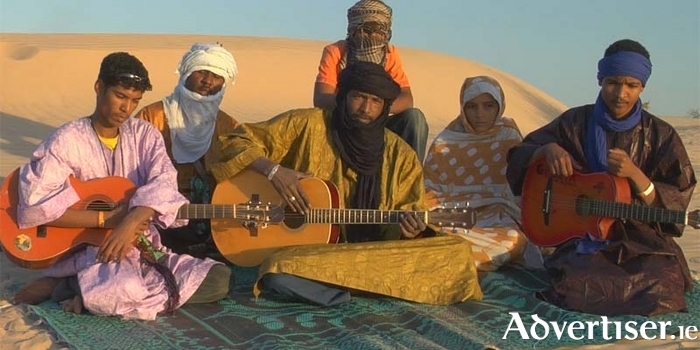 Music fans will be particularly interested in Sunday’s screening, The Last Song Before The War (Kiley Kraskouskas, Mali/USA, 2013 ) which features amazing performances from Mali’s 'Festival in the Desert' and the festival’s struggle to survive the country’s political, economic, and religious issues. There will also be a screening of the short film Drexciya (Simon Rittmeier, Germany/Burkina Faso, 2012 ), while the closing film will be Things of the Aimless Wanderer (Kivu Ruhorahoza, Rwanda/Britain, 2014 ). Made by the award winning director Kivu Ruhorahoza, this is a loosely connected narrative based around relations between locals and Westerners.